Marvel recently sent out one of their teaser images, simply with “MS.” and now, we have our answer as to what Ms. that could be. A brand new, teenage Ms. Marvel! New York, NY (November 6, 2013) — This coming January, Marvel Comics will continue to break new ground in its rich storytelling history as it launches the new monthlyMs. Marveldebuting as part of the Company’s popular All-New Marvel NOW! initiative. The All-New Marvel NOW! Launch provides readers and fans with accessible stories of their favorite characters, and in the case of Ms. Marvel, stunning new characters to delve into and explore. The All-New Ms. Marvel will be introduced in January in a special All-New Marvel NOW! Point One Comic Book in advance of the Marvel NOW!Ms. Marveldedicated series in February 2014. 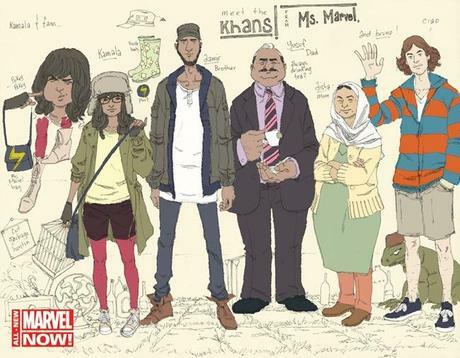 Ms. Marvelwill center on 16-year-old Kamala Khan, a Muslim-American teenager living in Jersey City, New Jersey. Like any teenager, all of her opportunities are in front her and she is full of potential, but her parents’ high expectations come with tons of pressure and has led Kamala to carve out a future that she has little interest in. “At her core, Kamala is just a 16-year-old girl, exploring the many facets of her identity when she is suddenly bestowed with super-human powers that send her on the adventure of a lifetime,” says Marvel Comics Editor In Chief Axel Alonso. The series, and its central character, are brought to life by an all-star creative team, led by acclaimed novelist and multi-Eisner nominee, G. Willow Wilson (Air, Mystic, Alif The Unseen). Her writings about modern religion have appeared in such outlets asNew York Times’ MagazineandThe Atlantic. Critically-acclaimed artist Adrian Alphona (Runaways, Uncanny X-Force) brings his vivid artistry to the project capturing the vibrantly rich and kinetic world in which Kamala lives. Every FIRST ISSUE bearing the All New Marvel NOW! branding includes a code for a free digital copy of that same comic on the Marvel Comics app for iOS and Android devices.